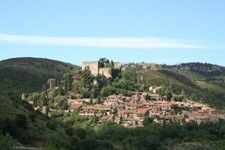 Languedoc-Roussillon - a good place to actively retire? I have inherited half shares in an apartment in Mallorca, which overlooks the sea. So why when I think about retiring do I want to look at Perpignan, on the French/ Spanish border in the department of Pyrénées-Orientales in the Languedoc-Roussillon? Since the arrival of the internet, whenever I want to make a decision I always check this out first. This gives me a structure to my decision making. So using the service "Ask Jeeves" (www.ask.com), I typed "Where is a good place to retire". What makes a good retirement destination? There seem to be several factors which must be considered. One is physical activity, reflected in the landscape, which includes walking, skiing, boating, golf, cycling and horse-riding, as well as having places nearby to visit. Another is cultural activity, such as art galleries, education opportunities and museums. Then there is climate, the optimum being generally not too hot in summer and warm in winter. The other factors are housing, good environment (avoidance of too much traffic and overcrowding), cost of living, low crime, good medical facilities and good communication links. Using these factors I realised that although my property in Mallorca was alright for short holiday visits, it was not the ideal place to retire. It scores high on many of the points above, such as cost of living and medical facilities, but because it is on an island it has limited cultural activities, particularly places to go, and is too dominated by tourism. Property prices are also high, compared to main land Europe. I rejected Barcelona, for being too busy and the Costa Brava, though very nice, as a little bit too dominated by tourism. Which is how I started looking at the area around Perpignan, which seems a good compromise. The climate seems friendly, possibly a little hot in the height of summer and a little bit cool in the depths of winter, but not too extreme. According to the guide books life is very laid back, mostly outdoors with civilised, two-hour lunch breaks, washed down with wine produced locally. The location is wonderful. The nearby coast line boasts modern tourist resorts, which I can avoid, to small underpopulated bays and fishing ports. The French, if anything, are more fanatical about water sports than the English and so there is sailing, water skiing and scuba diving. To the west is the vastness of the Pyrénées, with its gentle climbs. Within easy reach of Perpignan is also some very good skiing, which is not so crowded as the Alps (please keep this our little secret). Castles, Roman remains and picturesque villages dot the landscape with plenty of places to eat. It is only a short trip south to the Catalan region of Spain and Barcelona. Other factors that draw me towards the area are that the medical services are extremely good, air connections through Perpignan airport are good and cheap and there are other nearby airports. Road and rail links to Spain and the rest of France are excellent and the small university offers a good range of French courses. Although prices are rising rapidly in the area, there is still a wide variety of housing available if you look (from around £50,000 for a house needing some work). For a good quality, three-bedroom older house, suitable for a permanent home and close to Perpignan, prices start at around £100,000. In the country prices are a bit cheaper and if you are into renovating there are still some bargains to be had. So for the next few months I will be visiting the region frequently to learn about the life of the area and narrow down my search for a house or apartment. For further information and property around Perpignan please visit our Perpignan Property Guide. You may also find Languedoc-Roussillon Property - Insider's Guide and Retirement in France interesting to read.